Americans are experiencing icy conditions, flash floods or record-high temperatures depending upon where they live. As thousands sit without power in the Midwest, the East is experiencing unseasonably warm weather. NBC's John Yang reports. 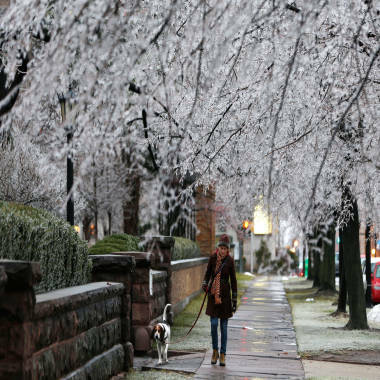 Thousands of people faced the prospect of spending the holidays in the dark, after a huge ice storm knocked out power throughout the Midwest and New England. Almost 400,000 homes and businesses in Michigan, upstate New York and northern New England were without electricity Monday morning after thick ice felled trees and brought down power lines, according to utilities companies. While lights came back on in many homes in upstate New York and Vermont, power companies in Michigan and Maine reported larger numbers of outages as the sun set on Monday. Brad Hoving, a meteorologist with the National Weather Service in Grand Rapids, Mich. – the state with a bulk of the remaining power outages — said many people may still be using candlelight until Thursday. "It's a big deal," Hoving told The Associated Press. "It's Christmas and we've just had a major ice storm." The Midwest was hammered by deadly storms and flooding over the weekend and ice storms ravaged parts of the Northeast, while record warm weather was reported along the east coast. NBC's Dylan Dreyer reports. The Red Cross set up a shelter at Middleville, Mich., United Methodist Church, but Pastor Tony Shumaker said the crowd was getting too big and needed additional accommodations like showers, so they would be moving to a local school. Church members planned to cook a Christmas dinner and bring it to the school for people who were still without power on Wednesday, Shumaker said. One of Michigan’s power providers, DTE, said crews were working “around the clock” and 90 percent of the 83,000 customers without electric would be restored by Christmas Eve. Stephanie Burnham, in Clarkston, Mich., was one of the luckier people who had their power restored. "We had just finished making dinner and ... we cleaned everything up. Then our power went out, so we got all our candles and set up our generator," she told ClickOnDetroit.com. "They told us it wouldn't be back until Christmas so we were like, 'Oh no all of our food!' But they did a great job." More than 1,000 utility workers from other companies and states headed to Michigan to help Consumers Energy customers out of the dark. Still, Consumers said more than 200,000 remained without power, and many areas in the southwest portion of Michigan would not have their electricity fully restored until after the holiday. “We might be spending Christmas at a middle school,” said Dawn Bishop, whose town of Dutton, Mich., lost power on Sunday. She said she was “a little nervous” about the possibility, but that she, her husband and her son — who is special needs — have been “taken care of very well” by the Red Cross. While Bishop’s Christmas plans remained uncertain, she stayed optimistic. “I’m sure we’ll be home by New Years,” she said. Michigan was hit with half an inch of ice over the weekend, said Brian Hurley, a meteorologist for the National Weather Service. “A quarter inch of ice is pretty damaging. When you talk about a half inch, that’ll take down trees and power lines,” Hurley said. By Monday morning, “you could skate down our road,” Bishop said. Heavy snowfall buried parts of the northern Midwest, with the heaviest covering coming in Larned, Kan., which saw over 15 inches. Heather Griffin, of Buffalo, N.Y., and her dog Sal walk beneath ice-covered trees on Sunday, Dec. 22, 2013, in Buffalo. Snow and ice knocked out power in parts of Michigan, New England and upstate New York over the weekend. The storm also saw some 1,200 U.S. flights canceled over the weekend and delayed another 15,000, according to the aviation-tracking website FlightAware. Flights on Monday were less affected, but more than 300 cancellations and 6,000 delays hampered plans for people trying to get to their Christmas Eve destinations. Nine deaths across the U.S. were blamed on the storm, the AP reported, including five people killed in Kentucky floodwaters and a woman in Arkansas following a 130-mph tornado. In Canada, an additional five people were killed in weather-induced highway accidents. While crews restored power to almost 100,000 Canadian customers on Monday, over 200,000 in Toronto were still in the dark, according to Toronto Hydro electric company. Elsewhere, New York City and Philadelphia saw record high temperatures, with shoppers taking to the streets in shirtsleeves. Still, temperatures would drop to seasonable levels by Tuesday. “The front which was responsible for all of the precipitation has cold air behind it,” Hurley said. Kevin Roth, lead meteorologist at The Weather Channel, said on Monday the worst of the storm was over, save for “one last gasp” to trouble commuters in the Northeast trying to see their friends and families before Christmas. AAA predicted that a record-breaking 94.5 million Americans will travel 50 miles or more between Dec. 21 and Jan. 1. "It will be a rough start to the week getting to grandma’s house," Roth told NBC News. "For anyone thinking of taking to the roads in the Northeast, based on the forecasts it would be better to leave it until Tuesday, when the weather is set to be a lot quieter." He said travel problems on Monday would be caused by a small amount of snowfall in northern Maine, around Caribou, as well as rain moving up from West Virginia to New England through the morning. Temperatures in Massachusetts are still right around freezing and the state could expect some freezing rain throughout the day. Other than that, Roth said, the weather would be quiet across the whole of the U.S. from Tuesday through the week. Hurley said last-minute travelers were fortunate that the extreme weather system made its way through the country over the weekend. “It’s going to be a pretty dry stretch here going into Christmas,” he said. A White Christmas – at least an inch or more of snow on the ground on Christmas day -- is forecast for much of the Midwest and the Adirondacks in upstate New York as well as upper New England, said Nick Wiltgen, meteorologist with The Weather Channel. “Areas that don’t have snow on the ground now are not likely to pick up anything over the next few day because most of the snow showers in the Midwest will be falling in areas that already have snow,” he said. That holds true for the West as well, where “no surprises for a White Christmas” are expected, Wiltgen said.